Microchip Month is Here! ~ Pawsitively Humane, Inc.
Have You Microchipped Your Pet? The Found Animals Registry is revolutionizing the way lost pets are reunited with their families through automated Found Pet Alerts. The automated Found Pet Alerts enable humane organizations to contact the pet owner through phone, email and text messages, with information on how to pick up the lost pet. The alerts will continue for up to four days, unless the pet is retrieved sooner. The registry is free and offers the fully automated alert system for reuniting pets with their families. One in every three pets is lost in its lifetime. In the past five years alone, more than 3 million lost cats and more than 760,000 lost dogs were never reunited with their owners. Through its initiatives in June, Found Animals aims to show pet owners that a microchip itself isn't enough – microchips must be registered, and contact information kept current, to increase the chances of being reunited with a lost pet. In celebration of Microchip Month, throughout the month of June, several Los Angeles-area partners will offer microchipping at a discounted rate of $10 per pet. These include Adopt & Shop, Angel Dogs Foundation, Spay-4-LA, SNP LA and FixNation. 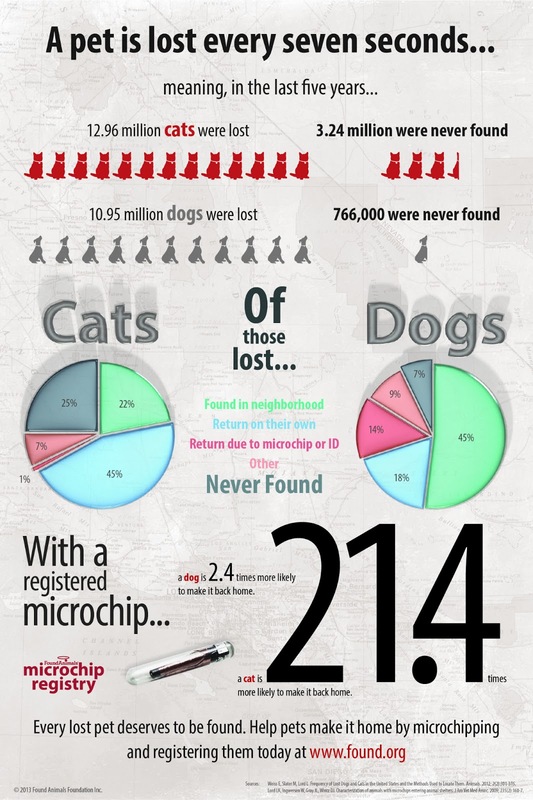 Along with the discount microchip, pet owners will also receive free lifetime registration in our Found.org registry. In addition to the free online registry, Found Animals provides low-cost microchips and scanners to shelters, clinics and veterinarians across the country, all in an effort to make microchipping, registering animals and reuniting lost pets with their families faster and easier than ever before. To register your pet now, visit www.Found.org. just tried it with Facebook too. I think something is malfunctioning with your sharing links! Hi Caren! I found a great tech who's working on fixing these links now! It only cost me $5 bucks. yes 5 bucks. One of the best tips I learned from BlogPaws last year was Fiverr.com Who can hire graphic designers and people to fix your blog for $5 a gig. It's wonderful.